Tom Kilworth is a British conductor with a broad-reaching musical career, having conducted both established repertoire and premieres of numerous contemporary works across the UK. He studied conducting at the University of Surrey under Russell Keable while pursuing his master's degree in composition and is currently completing a PhD thesis examining the works of Jean Sibelius and the modern Finnish composers, including Magnus Lindberg, Esa-Pekka Salonen and Kaija Saariaho. Tom also has an established career as an orchestrator and arranger, having worked on music for BBC's Revolting Rhymes (2016), Disney's Beauty and the Beast (2017), and with artists such as Sarah Brightman and Mumford & Sons. As a composer, Tom has had his music played by a variety of professionals including Notes Inegales, Delta Saxophone Quartet, Gemini, Huw Watkins, and Orpheus Sinfonia who premiered Tom's orchestral miniature Noctilucent as part of his being selected for their annual Composer of the Year award. Robert Wąs started playing the violin at the age of 7 and played in the the Huddersfield Education Services orchestras. By the age of 15, Robert was leader of the Senior Youth Orchestra under the conductor Colin Sutcliffe. After secondary education he attended the Huddersfield Music School, where his violin tutor was Bert Whone. Robert then joined the Coldstream Guards as a Musician and led their Orchestra. Whilst in the forces, Robert studied at Kneller Hall, the military music college in Twickenham. Towards the end of his time with the Guards, he was performing regularly in concert halls around London, also playing at the BBC, as a freelance musician. On leaving the Guards, Robert become a full-time performer in the same venues. Robert subsequently left professional music and became a software technician and later set up his own financial advising company. He also started a family and his musical priorities changed. In the late 90s’ Robert was introduced through his children’s Violin Teacher, to the Harrow Symphony Orchestra conducted by Brian Pickering. He sat at the back of the 2nds. Soon after, the leader left on a one-year sabbatical and Robert was invited to lead. As the former leader did not return, Robert was duly elected to the position. A few years ago, Robert was honoured to play at his daughter’s wedding. More recently he recruited three members of the orchestra to play in a string quartet at the Sir Christopher Wren Banquet for the Worshipful Company of Constructors. The Lord Mayor of London, Sir Andrew Parmley, accompanied Robert on the organ as part of the entertainment. 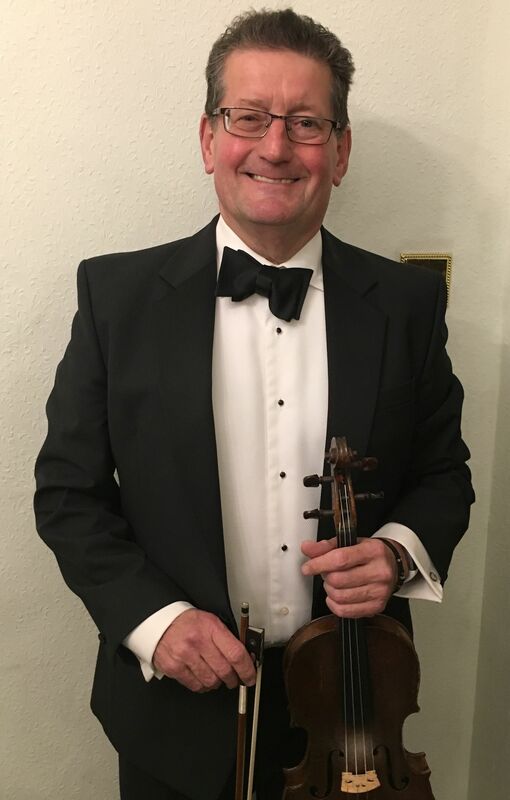 Robert’s three children are also violinists and have all played with the Harrow Symphony Orchestra: his second daughter, Helena, still plays with the orchestra. His wife, Catherine, and son, Jonathan, offer invaluable support serving refreshments during the interval at concerts. Andrew Hickman has been a member of the Harrow Symphony Orchestra trumpet section since 2008, after studying performance and conducting at Middlesex University. 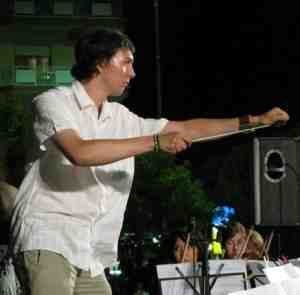 He has also taken the role of Assistant Conductor with the orchestra. Some of the highlights of Andrew’s musical career include performing at the Royal Albert Hall and the O2 with Harrow Young Musicians, as well as going on tours to Venice, Barcelona and Nice with the same organisation. He is a great lover of classical music in general, however is particularly interested in Romantic 20th century and English music of the late 19th and early 20th century. Outside of music, Andrew is a primary school teacher and a football referee, a job that has taken him abroad to tournaments in Lisbon and Dallas. He also loves travelling, and a couple of years ago, was lucky enough to take a year out from work and travel around the world.